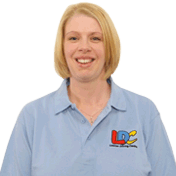 Hi I am Emily, I am a fully qualified Government Approved Driving Instructor (ADI) and have been with LDC since November 2012. I am a friendly, professional, easy going person I enjoy teaching and I want to pass on all my knowledge, experience and road safety to everyone I teach. My past career was in the hospitality industry and I have done this since leaving school so this is a complete change of life for me. I have lived in Pontefract for 13 years now previous to this I lived near Malton in North Yorkshire. I have been with my husband Andrew for 18 years this year married for 10 years. We have 2 little boys together Calum who is 6 and Archie who is nearly 3. We have a great family and friends support network around us.